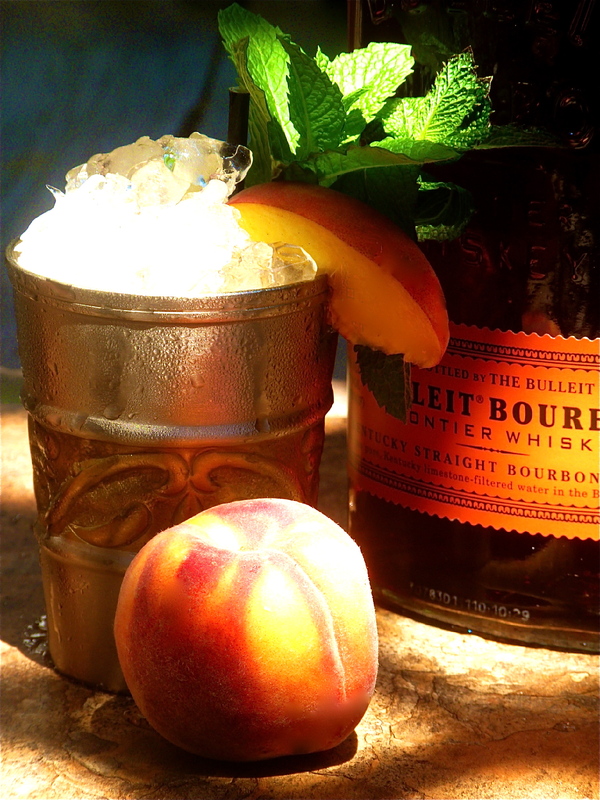 I made these Peach Bulleit Juleps for a party I was hosting in Dallas. We were on the rooftop next to the pool and it was the perfect cocktail to beat the heat. The Julep’s certainly cooled everyone off, set them free and if there was any shyness or fear among my guests it quickly melted into desire. Cut five juicy ripe peaches in half and place them on a hot grill. Grill the peaches until the grill marks are almost black. This gives the peaches a slightly smoky taste. Scoop out inside of peach flesh with a spoon and place it in a saucepan. Add honey, a pinch of cinnamon and one-fourth cup of water. Let simmer for ten minutes adding water if necessary. When the consistency is such that the syrup coats the back of a spoon, turn the heat off, let cool and fine strain into an airtight container.